A collaborative, gross-out fight-fest from leading cult intellects Silver Pictures and the Wachowskis. This ramps up the ninja film with baroque levels of bloodshed. Digital effects assist in lavishly savouring every severed limb and gush of the red stuff, with each exploding head acting to nullify the senses – the first of which happens even before the main titles. This graphic set-up introduces a 1000 year old Japanese ninja sect – the whereabouts of which is unclear – who are under investigation from a plucky pair of Europol agents due to a high number of prominent political murders. One of the agents discredits the absurd notion of ninja being the culprits, thereby highlighting the film’s complete implausibility, but the premise continues on regardless. We learn of the tortured back story of former clan favourite Raizo (played by Korean pop star Rain), who turns whistle-blower on his own cruel sensai. He talks of a troubled upbringing as an orphan, trained to kill without remorse. 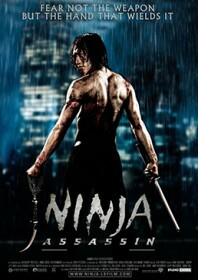 Thematically, the film is as clichéd as any other ninja film. It focuses on the conflict between western warfare and the exotic, secretive methods of the east, helped in no small part by the presence of Sho Kosugi – the genre’s top ninja. Influences arrive from all directions: Lady Snowblood during the training scenes, Alien during the big battles, and those creepy shadows from Ninja Scroll. All of which converge into the desensitised world of video-gaming. It should come as no surprise to learn that the film was released simultaneously with a mobile app. A complete re-write of the script was issued within weeks of filming, but it’s surprising the re-write took that long. More problematic is the film’s constant bloody carnage which soon becomes as effective as white noise. If ever a film suffered from overkill, this would be it.